we're back from brisbane!! brisbane was soooooooo freaking cool!!! everyone was so sweet, we ate vegan cheesecake for breakfast and saw so many great bands and participated in awesome workshops!!! also very importantly, we're playing this thursday!! check out flier below and if ya can't see it i've written deets out. 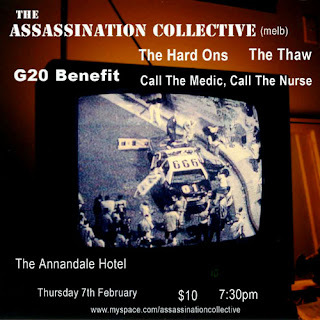 the assassination collective/the hard-ons/the thaw/call the medic, call the nurse!! pretty sure it's not all ages, really sorry!! ps: if anyone has photos of us from melbourne or brissy and would like to share, then send em our way - thethawthethaw at gmail dot com. gah, am busy... more gigs, please, am missing noiserock goodness.